View cart “Q10” has been added to your cart. Ubiquinol, the reduced form of Q10, is available in a stable form of Kaneka. Kaneka QH Ubiquinol stands for guaranteed Kaneka quality and purity. Kaneka QH Ubiquinol is produced during yeast fermentation and is a natural product. Kaneka QH Ubiquinol is Kosher. Kaneka QH Ubiquinol is a patented product. Read more about the quality of Beyuna Q10 under the 'quality' tab. Take 2 capsules per day during or after the meal. Dark, sealed, cool (15-25 °C), out of the reach of children. 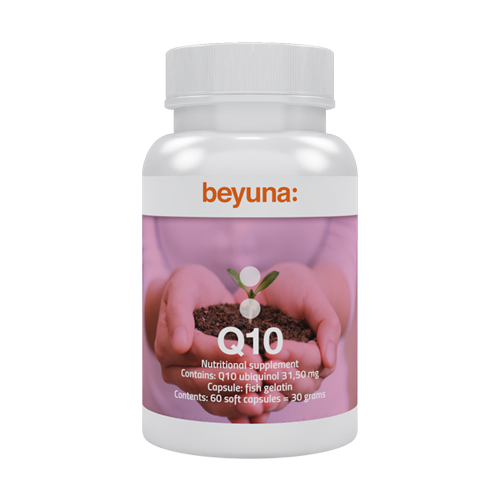 Beyuna Q10 is made from ubiquinol, a reduced form of Q10. Often the non-active form ubiquinone is added to Q10. The body converts this to ubiquinol, the bioactive form that occurs naturally in the body. With Beyuna Q10 the body can skip this step, as the product is made from ubiquinol, the bioactive form that occurs naturally in the body. Until a few years ago only ubiquinone, the inactive form, could be sold. The Japanese company Kaneka has succeeded in launching the active form, ubiquinol, with guaranteed quality and purity. Kaneka QH Ubiquinol is produced through yeast fermentation, making it a natural product. Kaneka QH Ubiquinol is Kosher and is a patented product. For whom is Q10 Ubiquinol important? When we are young our bodies produce enough ubiquinol, but as people age our natural ubiquinol production slows, from around the age of 20. Besides age, other factors such as sport can cause ubiquinol deficiency. Sporty people expend more ubiquinol when they work out and need to supplement this vital substance. Extreme stress, diets which do not contain enough ubiquinol or certain medications (such as statins and/or cholesterol-lowering drugs) can also deplete your body's Q10 levels.